Presented October 9, 1992 for Laminitis. History: laminitis since February 1992. Currently being treated with aspirin and isoxsuprine. Patsy would walk well on aspirin but would become grade III lame when aspirin dose was decreased. Patsy was about 100 pounds overweight and her hair coat was coarse and dull. Her hooves were trimmed well but very hard and dry. At this time my goal was to wean her off aspirin so I could evaluate her symptoms. I started her on Bell 200c every 6 hours on October 10th. On October 11th she was given Bell 200c every 8 hours, on October 12th she was completely off drugs and walking fairly well. She also had poultices on her feet to soften the hoof wall and allow the foot to expand. This relieves the pressure and pain from the swollen laminae. I attempted to start Patsy on MSM but she refused to eat it. Her diet at this time was bran mashes, coastal hay and a small amount of alfalfa. On October 16th Patsy was given Thuja 1m to address vaccinations, coarse dull hair coat and obesity. She was discharged, moving very well on October 22nd, at which time she was given Calc Carb 1m. I did not feel the Thuja would act deeply enough to cure this case; Calc Carb fit her calm temperament, and Calc Carb is the chronic remedy for Belladonna which had given very good results. Patsy had several mild setbacks over the winter of 1993. She was treated again with Thuja 1 m. Silicea and Sulphur were used, as well as poultices on her feet. I suspected deep abscesses but I was not able to locate any. Patsy had a very nice coat and seemed over all very healthy. There were very few symptoms to prescribe on. Patsy seemed to stabilize over the summer, then got sore again in October 1994. After unsuccessfully attempting to manage Patsy with phone consults she was hospitalized on December 9th. Her hair coat was dull again and it was obvious I had been palliating symptoms. Generalities – cold wet weather aggravates. Based on the case work-up, Patsy was started on Lyc 6c twice a day and Blue-green Algae 1 teaspoon twice a day. Her diet was bran mash, flaked corn and coastal hay. She was offered Advanced Biological Concepts free-choice minerals. She ate P mix (phosphorus) TS (trace minerals) BVC (B vitamin mix) A mix (vitamin A) and 1:1 (calcium/phosphorus). By December 18th Patsy's dull hair was shedding and she was drinking better. Patsy went home January 6, 1995 on Lyc 12 twice a day. She was continued on a bran mash/corn ration with coastal and alfalfa hay. She was continued on Blue-green Algae and E biotic. On January 18, 1995 Lyc 12c was stopped and 1 dose of Lyc 30c was given. On March 15, 1995 Patsy became lame in a back foot. She was given Sil 30c twice a day for 5 days. 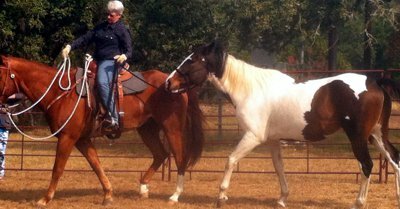 On March 27th Patsy's owner reported the abscess had opened and Patsy was now sound, running and bucking in the pasture. In January 1997 Patsy's owner reported no lameness, but a dull hair coat. She had taken Patsy off all nutritional supplements. I suggested she restart Blue-green algae and probiotics. She did this and Patsy's hair became shiny again. She has been very healthy since. In the summer of 1999 two horses at the owner's farm foundered after the pasture was fertilized. Patsy was grazing the same pasture, but did not have any problem. The other horses responded to homeopathic and nutritional treatment. Patsy was a very interesting case in many ways. After palliating her symptoms for several months, I learned not to attempt to prescribe remedies unless I had a clear picture of the case. I learned from Patsy how important it is to look at the whole picture. I was focusing on her feet when her problems were originating in her digestive tract. I also learned how important super nutrition is for healing. The remedies did not work without the nutrition and the nutrition did not work without the remedies. This appears to be a true cure in that Patsy is no longer susceptible to the trigger that originally caused her problem (the fertilized pasture being the unplanned "litmus test"). We determined in hindsight that fertilized hay was part of Patsy's problem. When Patsy would come to the clinic she would stabilize, only to relapse when sent home. The only difference had been the hay. I feed coastal hay from a grower that does not fertilize heavily. Since working with Patsy I have found heavily fertilized hay to cause problems in other cases. It is unfortunate our soils are so depleted that fertilizers are required. The problem is that only a few nutrients are added back when synthetic fertilizers are used. Another problem with synthetic fertilizers is that they destroy the healthy bacteria in the soil. Plants need healthy soil bacteria to absorb micro-nutrients and have healthy immune systems. Plants grown with synthetic fertilizers may therefore require more herbicides and pesticides to survive. So, how does this contribute to laminitis? In Patsy's case I suspect the high nitrogen content of the hay stressed her liver and kidneys. This stress on her organs of detoxification caused toxins to build up in her system. When the body becomes overloaded with toxins it tends to tighten up. As the muscles tighten the tendons become contracted as well. The deep flexor tendon of the front leg attaches within the foot at the back of the coffin bone. As the tendon is pulled by the tight muscles, it puts pressure on the coffin bone. This is why some chronic laminitis cases do not react to hoof testers at the toe. The pain is coming more from the tight tendons. Eventually pain will come in the toe as the coffin bone rotates. The other problem Patsy had was a deficit of micro nutrients in her diet. As you recall, she was overweight so she got very little grain. She was mostly eating hay, which did not have many vitamins or minerals in it. This could be part of the reason she had more trouble in the winter when she had no access to pasture. Heavily fertilized hay is only one source of toxins, but in Patsy's case it seemed to be the main source. Most likely she had an underlying weakness that made her more susceptible than the other horses, and this underlying susceptibility appears to have been corrected with nutrition and homeopathic treatment.